Every single day, we are getting closer to a horrific global water crisis. This world was blessed with an awesome amount of fresh water, but because of our foolishness it is rapidly disappearing. Rivers, lakes and major underground aquifers all over the globe are drying up, and many of the fresh water sources that we still have available are so incredibly polluted that we simply cannot use them anymore. Without fresh water, we simply cannot function. Just imagine what would happen if the water got cut off in your house and you were not able to go out and buy any. Just think about it. How long would you be able to last? Well, as sources of fresh water all over the globe dry up, we are seeing drought conditions spread. We are starting to see massive "dust storms" in areas where we have never seem them before. Every single year, most of the major deserts around the world are getting bigger and the amount of usable agricultural land in most areas is becoming smaller. Whether you are aware of this or not, the truth is that we are rapidly approaching a breaking point. If dramatic changes are not made soon, in the years ahead water shortages are going to force large groups of people to move to new areas. As the global water crisis intensifies, there will be political conflicts and potentially even wars over water. We like to think of ourselves as being so "advanced", but the reality is that we have not figured out how to live without water. When the water dries up in an area, most of the people are going to have to leave. And yes, it will even happen in the United States too. For example, once Lake Mead dries up there is simply no way that so many people are going to be able to live in and around Las Vegas. Right now, most of us take for granted that we will always have access to an unlimited amount of clean water. But when you take a hard look at the data, it quickly becomes clear that everything that we have always taken for granted about water is about to dramatically change. #1 Today, the United States uses approximately 148 trillion gallons of fresh water a year. #2 According to the U.S. government, 36 U.S. states are already facing water shortages or will be facing water shortages within the next few years. #3 Since 1998, the level of water in Lake Mead has plunged by more than 50 percent. Lake Mead supplies about 85 percent of the water used in Las Vegas, and at this point the lake has 5.6 trillion gallons less water than it used to have. Lake Mead is falling so fast that some believe that the Hoover dam could actually stop producing electricity in a few years. Needless to say, that would be a total disaster for that entire region of the country. In addition, if things continue at the current pace, it is being estimated that Lake Mead will run completely dry some time around the year 2021. #4 According to the U.S. National Academy of Sciences, the U.S. interior west is now the driest that it has been in 500 years. "Our goal now is to engineer a soft landing. That's all we can do." #6 A federal judge has ruled that the state of Georgia has very few legal rights to Lake Lanier. Lake Lanier is the main water source for the city of Atlanta. Millions more people are expected to move into the Atlanta area in the coming years, and this is creating an absolute nightmare for city officials. #7 It is estimated that California only has a 20 year supply of fresh water left. #8 It is estimated that New Mexico only has a 10 year supply of fresh water left. #9 Things have gotten so dry in Arizona that now giant "dust storms" have been blowing through the city of Phoenix. #10 Texas is has experienced one of the driest stretches that it has ever seen. Right now, approximately 81 percent of the state of Texas is experiencing "exceptional drought" conditions, and wildfires have burned an astounding 3.6 million acres in the state. #11 Approximately 40 percent of all U.S. rivers and approximately 46 percent of all U.S. lakes have become so polluted that they are are now considered to be too dangerous to fish in, swim in or get drinking water from. #12 Eight states in the Great Lakes region have signed a pact banning the export of water to outsiders - even to other U.S. states. 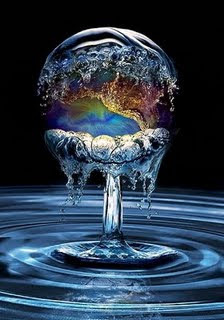 #13 It is being projected that by the year 2030, global demand for water will be 40 percent higher than it is today. #14 Worldwide demand for fresh water tripled during the last century, and is now doubling every 21 years. #15 According to USAID, one-third of the population of the earth will be facing severe or chronic water shortages by the year 2025. #16 Of the 60 million people added to the world’s cities every year, the vast majority of them live in impoverished areas that have no sanitation facilities whatsoever. #17 It is estimated that 75 percent of the surface water in India is now contaminated by human and agricultural waste. #18 If you can believe it, according to a UN study on sanitation, far more people in India have access to a cell phone than to a toilet. #19 In the developing world, 90 percent of all wastewater is discharged completely untreated into local rivers, streams or lakes. #20 Every 8 seconds, somewhere in the world a child dies from drinking dirty water. #21 Due to a lack of water, Saudi Arabia has given up on trying to grow wheat and will be 100 percent dependent on wheat imports by the year 2016. #22 In northern China, the water table is dropping one meter every single year because of drought and overpumping. #23 Incredibly, a new desert the size of Rhode Island is created in China every single year because of drought and overpumping. #24 In China, 80 percent of all major rivers have become so horribly polluted that they do not support any aquatic life at all at this point. #25 Collectively, the women of South Africa walk the equivalent of the distance to the moon and back 16 times a day just to get water. Right now, more than a billion people around the globe do not have access to safe drinking water. That number is going to keep increasing. Without enough fresh water, people cannot grow enough food. Global food prices are already starting to skyrocket, and the coming global water crisis certainly is not going to help matters. A massive, massive disaster is on the horizon. The era of gigantic amounts of cheap food and "unlimited" amounts of clean water is over. A horrific global water crisis is coming.